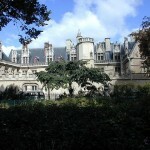 Home to a remarkable collection of paintings, sculptures, tapestries, stained glass, gold and silver work, illuminated manuscripts, religious artifacts and even everyday objects like clothing and household goods, the National Museum of the Middle Ages (Musée national du Moyen Âge) brings the Medieval epoch of France brilliantly to life. Displayed in the Hôtel de Cluny, considered the finest remaining 15th century Gothic mansion in Paris, the museum is located in the Latin Quarter (Quartier latin) on the Left Bank, one of the city’s most historic parts and adjoins an excavated 2nd century Roman Bath, a portion of which has been incorporated into the museum’s galleries complete with a mosaic of “Love Riding a Dolphin”. 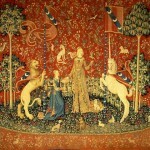 By far the most celebrated and priceless masterpieces of the collection are the six “Lady and the Unicorn” (“La Dame à la Licorne”) tapestries dating to approximately 1485. Discovered moldering in a castle in the French countryside in 1842 by a government inspector, they were made famous by the writer Georges Sand who lauded them for their beauty and philosophical complexity and ultimately used her celebrity to secure their rescue. Purchased and restored by French cultural authorities, they have been the crown jewel of the museum’s holdings since they first went on display in 1882 and have long been referred to as Paris’s other “Mona Lisa”. 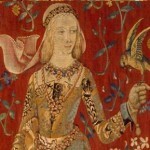 Spun in wool, silk and gold, hung in a specially designed oval gallery complete with long benches for extended appreciation, they consist of approximately 11-foot square, richly symbolic panels that depict a beautiful young lady flanked by a fanciful white unicorn as she experiences each of the five senses, “Touch”, “Taste”, “Smell”, “Sight” and “Hearing” with the sixth panel more mysteriously titled “To My Only Desire” as the same beautiful young lady is presented an extravagant necklace. The expansive collection is divided into seven separate departments including Antiquity and Early Middle Ages, the Religious World, Gothic Sculpture, Paintings-Miniatures-Stained Glass, Gold-Silver-Ivory, Tapestries-Fabrics-Embroideries and Everyday Life Objects. The collection is considered among the finest of its kind in the world with the sculpture, stained glass and tapestry holdings of particular renown. The Gothic sculptures which are uniquely displayed in the gallery that was originally the “frigidarium” of the Roman Baths include the miraculously recovered “Heads of the Kings of Judah”, 21 stone busts carved in 1225 for the facade of Notre Dame of Paris Cathedral. Hacked off the church facade in 1793 in response to the French Revolution and believed to be destroyed, they were discovered buried under a bank during a renovation in 1977 and are not only the earliest and most finely wrought sculptural details from Paris’s Medieval period, they are considered among the 20th century’s most significant archaeological finds. Not to be missed other select works of outstanding achievement are the two, 7th century, “Visigoth Votive Crowns” forged in gold and adorned with precious jewels, the 11th century “Gold Altar from the Basel Cathedral”, the exceptionally sized ivory statue of the “Madonna and Child” carved in 1260, the sculpted “Rose of Gold” from 1330, the stained glass window of “Chess Players” from 1440 and the Tarascon “Pieta” painted on wood in 1457. 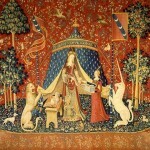 An excellent destination for families, children enjoy the whimsical menagerie of animals depicted in the Unicorn Tapestries, which even appear reproduced as decor in the Gryffindor Common Room of the Harry Potter films. The objects from everyday life like suits of armor, ladies gowns and toys and games are also certain to fascinate even the smallest and most museum-averse little ones as are the authentic Gothic gardens that surround the building. No current exhibitions. “The Time of the Merovingians” opens October 26, 2016. Wednesday through Monday from 9:15 a.m. to 5:45 p.m. Ticket office closes at 5:15. Holiday closures on January 1, May 1 and December 25. 8 € for an adult ticket. 6 € for a youth ticket (18 – 26). 1€ additional for temporary exhibitions. Free for those 17 and under. Free for all on the first Sunday of every month.